If the gifts under your tree are anything like mine, they seem to nearly ALL require some type of battery! If you have a Staples nearby, you will want to take advantage of this hot deal. 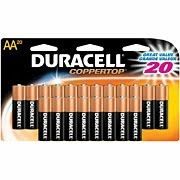 Now, through December 2nd, when you purchase any 20 Pack of AA or AAA Batteries, you get 100% back in Staples rewards, which means FREE batteries!! If you take along this printable coupon, you will get 10% off of your purchase and actually MAKE money. Note that this coupon is good only today.